Prepare to drive 4x4 style. Drive through river crossings, huge sand dunes and technical forest crossing. That is what you will experience on a quad bike. The venue offers a wide variety of trails for all age groups. Wear clothes that can get wet and dirty. No skirts, high heels or costumes. After the briefing, you will be required to sign one of our indemnity forms. 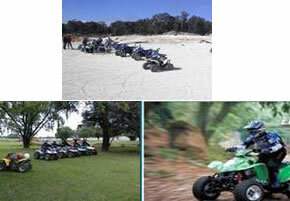 Pricing includes quad hire, outrides, refreshment during the ride, safety equipment and guide. Pricing excludes all drinks, souvenirs and additional biking equipment.